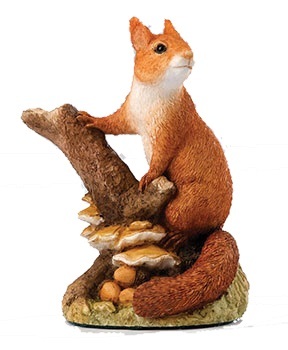 Border Fine Arts create realistic wildlife figurines and countryside scenes. The company was founded in 1974 by John Hammond initially producing for a short time bronze and silver figurines, and later hand-painted figurines after a suggestion from a customer – ‘People like ’em small and likes ’em painted‘. John Hammond is now the Chairman of ENESCO UK Limited. Pictured right: B1626 Wee Timorous Border Fine Arts Symbol of Membership 2015/2016 – Our timid field mouse is just about to tuck into a tasty rosehip when he is aware of something moving nearby — ah, ‘the best-laid schemes o’ mice an’ men…gang aft agley’! Sculpting a field mouse and being based in Scotland, we couldn’t resist making reference to the immortal bard, Robert Burns, in his famous poem, To a Mouse (Tae a Moose). Border Fine Arts now has world-wide reputation for the quality of its wildlife studies and there is also a growing interest in the secondary market with early editions increasing significantly. The Fergie was a Limited Edition of 1250 produced in 1992 is now valued at over £2,500 ($4,000) against an original cost of £195 ($300). Many of the Border pieces reflect a mix of British culture and wildlife such as the very popular James Herriot Collection. The Border Fine Arts Society was formed in 1989 and allows members to receive a joining symbol of membership and the opportunity to buy the Society Annual Figurine. Border Fine Art Society membership other benefits includes An Introduction to Border Fine Arts, two issues of the BFA Society magazine The Borderer in spring and autumn, invitations to special events and a priviliged customer programme. Note: This site is not affiliated with ENESCO TM or Border Fine Arts TM. It is designed to provide information to collectors of Border Fine Arts figurines.